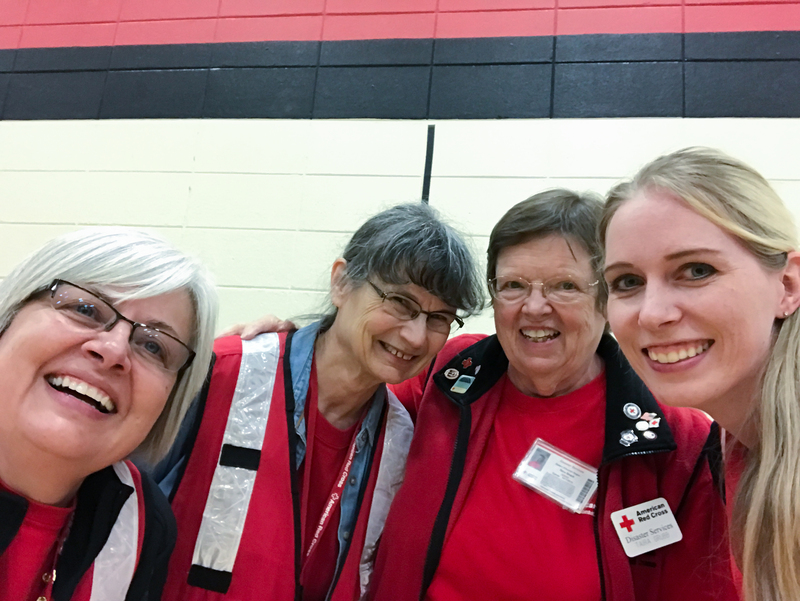 Trained Red Cross members remain onsite in Chetek and Conrath, Wisconsin providing as needed services to affected residents. Significant home and business damage in both of these regions will require continued support and assistance. Red Cross volunteer assists with residents reuniting with their pet. The American Red Cross continues to collaborate with emergency management agencies and community leaders to provide any disaster related relief available which includes: shelter, food/water, mental health, medical assistance, and coordination of pet care assistance through the Barron County Humane Society and a significant donation by Pet Supplies Plus. Trained staff will remain onsite in both locations until all of the needs of the residents are met and normal life routines have resumed. The Red Cross depends on the generous support of the American public to fulfill its crucial mission. Help people affected by disasters like floods, wildfires and countless other crises by making a donation to support Red Cross Disaster Relief. These gifts enable the Red Cross to prepare for, respond to and help people recover from disasters big and small. Make a donation today by visiting https://www.redcross.org/ donate/donation, calling 1-800-RED CROSS or texting the word REDCROSS to 90999 to make a $10 gift. We can’t say THANK YOU enough to our dedicated volunteers! “Look at that smile, isn’t that priceless”, says Taira Grubb, as she is watching one of her shelter residents unfold his new pair of pants. He is one of more than 80 elderly residents that lost everything in a Manitowoc apartment fire—from clothes to medication and furniture, photos and memories. 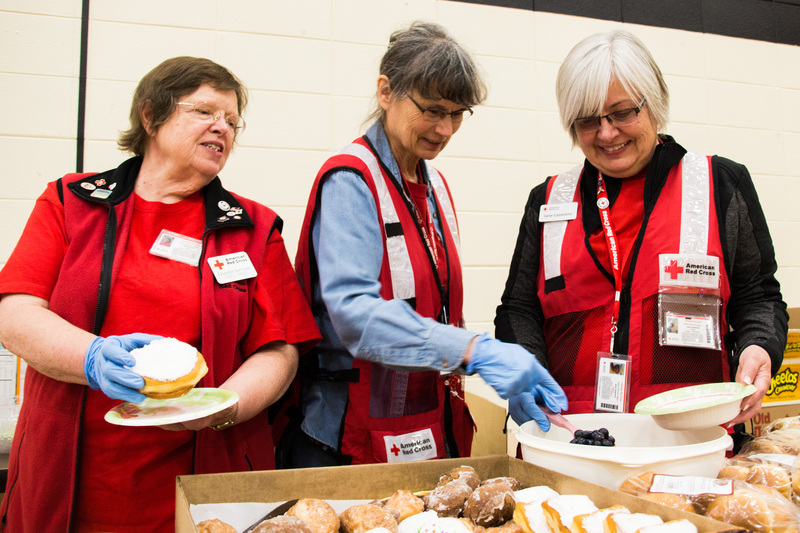 American Red Cross responders from all over Wisconsin raised their hands quickly to help open up and run a shelter at the Wilson Junior High School, to provide basic needs like food, clothing and a place to sleep. “Whatever you can do, you can give something”, says Jane. In previous deployments she worked in many different positions, from setting up computers, to logistics, staffing and general shelter work. Likewise, her fellow Washington-County volunteer Bobbi has held different positions at the Red Cross. She was previously an office manager and is in disaster-work now, experienced in assisting clients in traumatic situations like the Manitowoc fire. Terry Wesenberg, a licensed clinical social worker and licensed counselor and Red Cross Volunteer. A variety of skills were needed at the Manitowoc shelter and highly-trained workers are indispensable. Terry Wesenberg joined the shelter as a licensed clinical social worker and licensed counselor. He is one of the Red Cross’s most experienced mental health professionals. For many years he was in the army, offering his help to soldiers. After his retirement from the Armed Forces he worked with the Federal Emergency Management Agency (FEMA) for six years in disaster work. 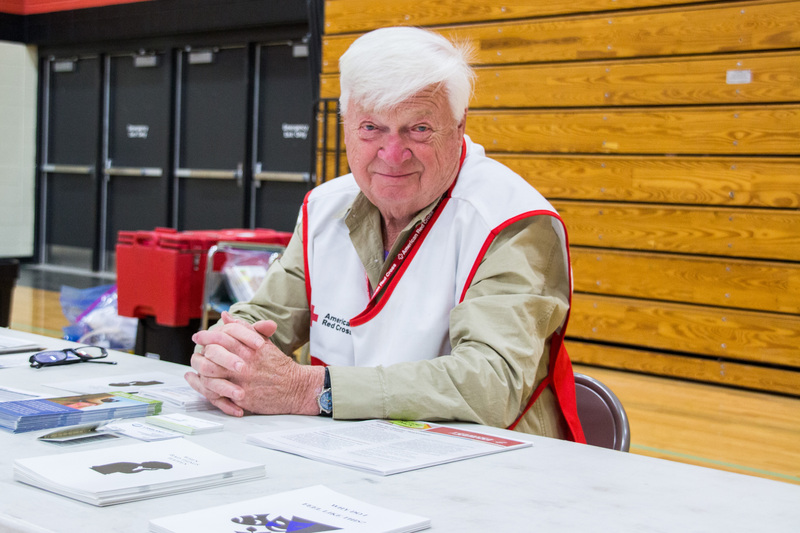 Being a Red Cross Volunteer for more than 30-years, he has helped more people than he could count. “I headed out to help after six Hurricanes”, he recalls. He travelled to the Gulf Coast to assist after Hurricanes Katrina, Rita, and Wilma in 2005, and was in New York for Hurricanes Irene and Sandy in 2011 and 2012. When asked about his most memorable experience in all these years, he recalls his conversation with a 90-year-old woman after Superstorm Sandy. “When storm hit, she carried six white banker-boxes from her basement into her living room, to protect them from the flood”, he recalled. The boxes contained pictures, stories, and poems from her deceased granddaughter. With the water forcing its way into the house, the boxes got wet and all memories destroyed. Yet the woman refused to throw them out. “This is all I have left” Terry recalls her saying. His extensive experience helps Terry support the Manitowoc fire victims, who also lost all of their belongings in the fire. Although his work can be tough, Terry very much enjoys volunteering, specifically because of the fellow volunteers he meets. “If you go out you will meet the best people. You want to know them all”, he says.